The Minister of Power, Works and Housing, Mr Babatunde Fashola, has approved the payment of N133 million compensation to Abia communities for land acquired for the construction of a trailer park on Enugu-Port Harcourt Expressway. 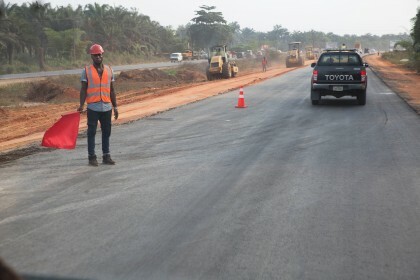 The Federal Controller, Federal Ministry of Works, Mr Chukwudike Nwankwo, spoke in an interview with News Agency of Nigeria (NAN) on Friday during the minister’s inspection of the rehabilitation work on the Okigwe end of the expressway. Nwankwo said the ministry would commence the disbursement of the fund to the five communities in Umunneochi Local Government Area where the land for the project is located. Nwankwo further said the minister had directed the immediate evacuation of the trailers from the two sides of the dual carriageway to allow for free-flow of traffic. He said that the ministry would also fence off the cattle market from the expressway. The controller commended the minister for attracting additional budgetary allocation which had made progress of work on road rehabilitation projects nationwide possible. Heavy-duty trucks, trailers and the cattle market had spilled into the dual carriageway and hampered smooth traffic flow. Earlier, Mr Fouad Sarraf, the Area Manager, SETRACO Nig. Ltd., the contractor, complained that work was stalled at Lokpanta due to the overflow of the cattle market into the road and the presence of heavy duty truck. Addressing newsmen at the end of the inspection your, Fashola expressed delight that the use of SUKUK fund had brought tremendous progress on the project. He said the ministry would apply for another intervention from SUKUK so that more money would be made available to the contractors to ensure the completion of the project before the next rainy season.